The authors of the No Pressure Cooker blog are BIG fans of Cooking Light magazine. We both like to eat well, but eat healthy. A lot of our recipes start with or are inspired by CL mag. Once and a while, I want to cook everything in the whole mag and October 2013 issue is one of those. Oh, and it started to rain in the Pacific Northwest again, so bring on the comfort food! I used to work in a restaurant (well, I sold art and books in the front, and wasn't really wanted in the kitchen, but "helped out" every once and a while.) 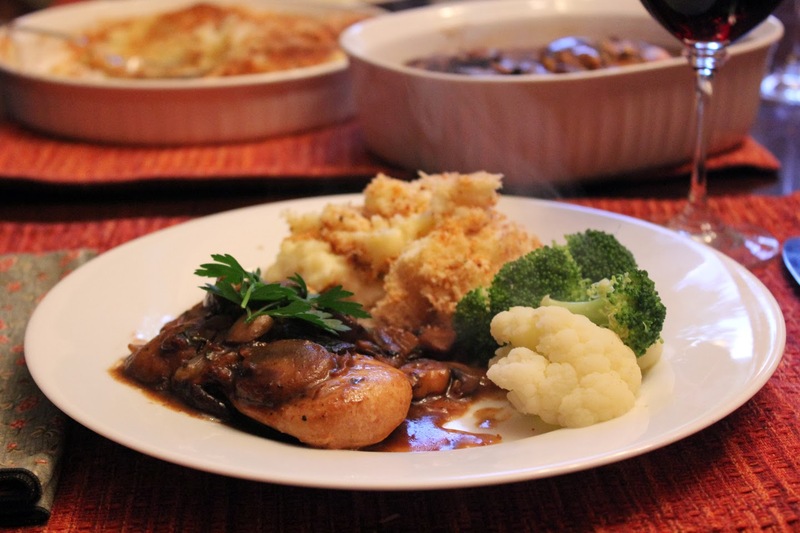 Anyway, this restaurant served Chicken Marsala with mashed potatoes once a week and it was a lovely, comforting, FILLING meal. This meal is a lighter version, with tons of flavor that didn't leave me needing a nap. Place porcini mushrooms in a medium bowl and cover with 2 cups boiling water. Let stand 30 minutes or until tender. 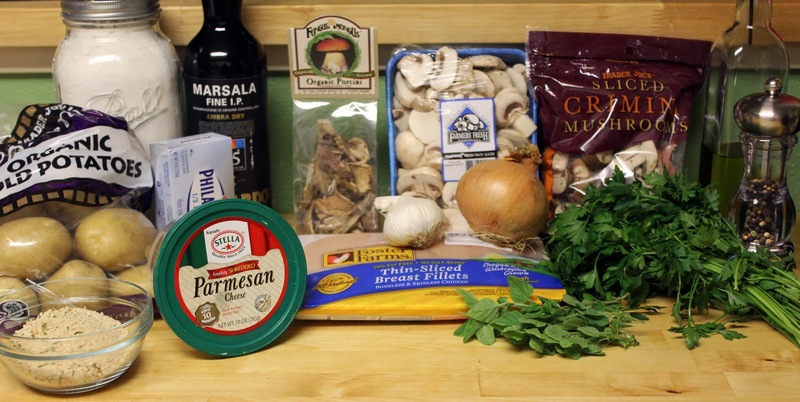 Drain mushrooms, but reserve liquid, this recipe calls for it again. 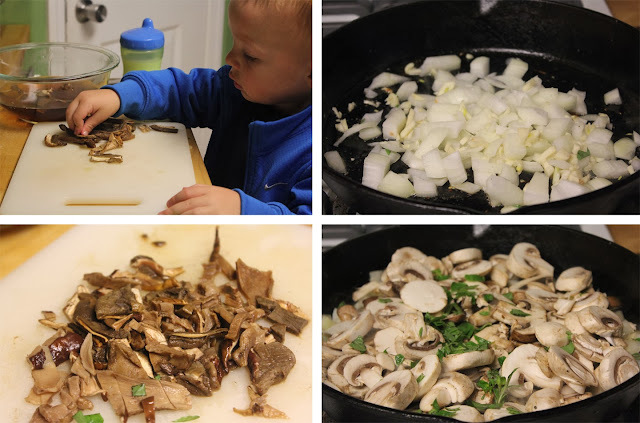 Thinly slice the soft mushrooms. Chop onions, garlic, and oregano - set aside. The chicken breasts need to be thin, so if you don't have thin-sliced chicken, place breasts between plastic wrap and pound with a heavy skillet until thinned to 1/2 thickness. Season with salt and pepper. In a large skillet (I initially used a 10" skillet and traded up after cooking the chicken and used my 12" diameter cast iron skillet) heat 1 tablespoon of olive oil. Add chicken and cook 3 minutes on each side - they will be just under done. Remove from the skillet, cover and keep warm. Heat the remaining olive oil in the pan and heat to medium-high heat. Add onion and garlic and saute 2 minutes. Crank up the heat to high and add in the sliced porcini mushrooms and the fresh mushrooms, 1/2 teaspoon of salt and oregano. 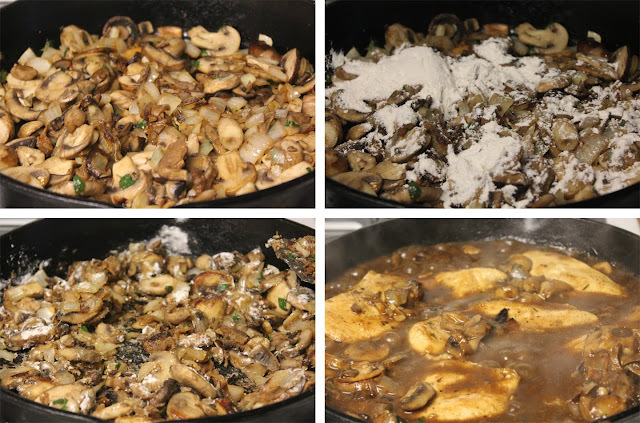 Saute until mushrooms darken and start to release moisture - about 8 minutes. Sprinkle with flour and cook 1 more minute stirring constantly. Stir in the stock, wine and mushroom soaking liquid. While whisking, cook 3 minutes or until thickened. Add in the chicken breasts and cook about 4 more minutes to finish cooking chicken. Turn chicken once. Sprinkle chopped parsley on top. Peel and slice the potatoes into 1/2 inch discs. Boil potatoes, garlic and 1/2 teaspoon salt for 15 minutes or until the potatoes are fork-tender. 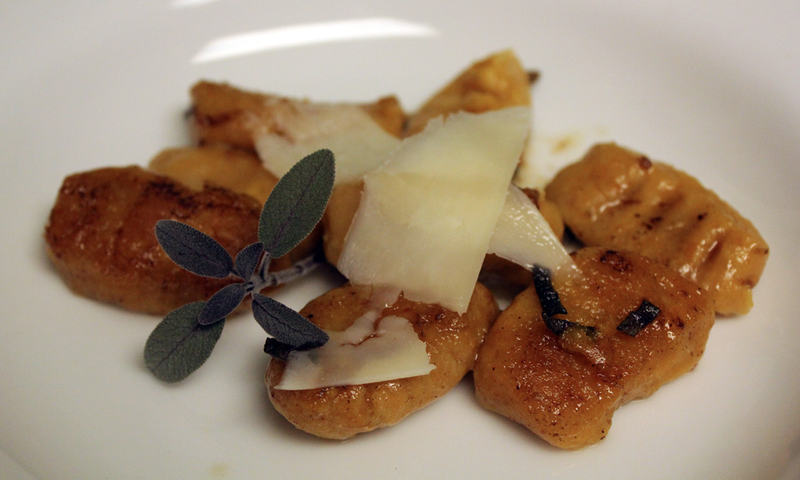 In a small bowl combine the Parmesan cheese and bread crumbs and set aside. In a mixing bowl add 1/4 cup half and half, salt and softened cream cheese. Add drained potatoes to the mixture and mix to combine. We used a pastry blender, but a ricer, or a potato masher would work just as well. 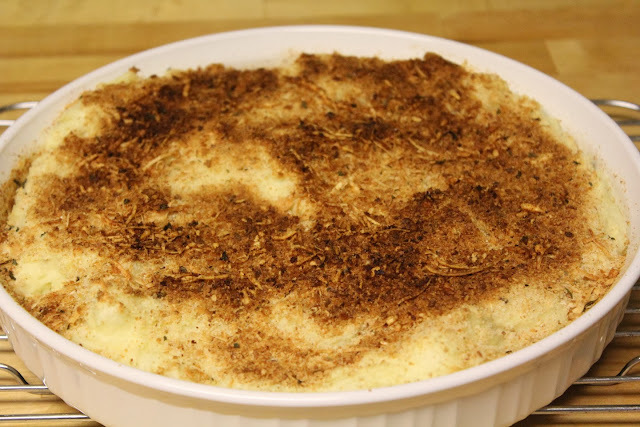 Spread the potato mixture into a shallow baking dish sprayed with cooking spray or coated in butter. I used a 10" ceramic tart pan and it was the perfect size. Sprinkle the Parm/breadcrumbs over the top of the potatoes and bake at 350 for 20 minutes, or until thoroughly heated and browned on top. The Chicken Marsala was great - I really wouldn't change a thing. Great amount of sauce and great flavor! 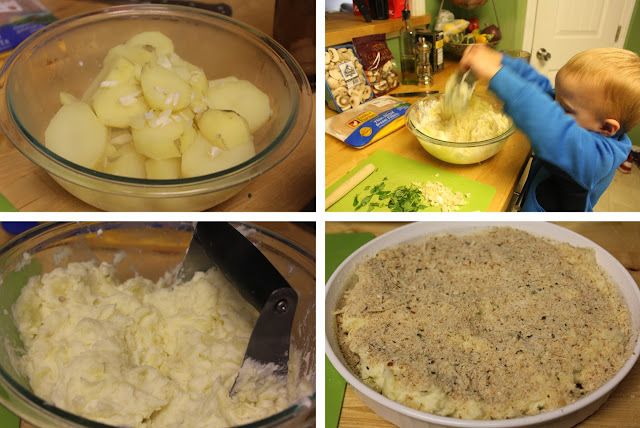 The potatoes were really good, but I will reduce the amount of breadcrumbs in the topping by half next time. The topping was a little thick in my opinion. Thanks so much for the detailed instructions including a side dish recipe- no fail!